Chrome is the first browser that has a smart spell-checking feature powered by a web service. Originally, Chrome only relied on a local dictionary. Then Chrome's team started to add suggestions from a Google service to the contextual menu and improve the list of suggestions from the local dictionary. Chrome 26 dramatically improves spell checking by bringing the Google Docs and Google Search spell checker to the browser. "We're now rolling out support for grammar, homonym and context-sensitive spell checking in English, powered by the same technologies used by Google search. Support for additional languages is on the way," informs Google. Right now, this feature is not available in Chrome for Mac, but it will be added soon. The enhanced spell-checker is opt-in, so it's not enabled by default. You need to right-click a text field, go to "Spell-checker options" and make sure that "Ask Google for suggestions" is enabled. It's a privacy-sensitive feature, since everything you type is sent to Google's servers. Context-sensitive spell checking, first available in Google Wave, is incredibly useful. Sometimes you can make mistakes and write "fund a place" instead of "find a place" or "took a brake" instead of "took a break". A regular spell-checking software can't detect these errors because "fund" and "brake" are words from the dictionary. Google uses the language models built for Google Translate to find the words that don't belong in a certain context and highlights them. Right-click the underlined words and click Google's suggestions. 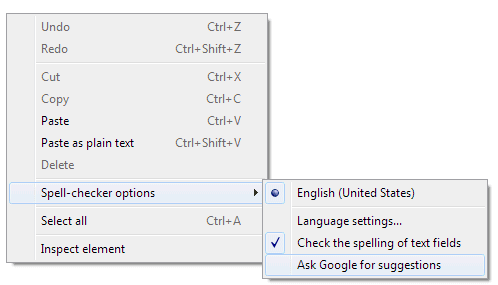 Even if you enable online spell-checking, Chrome will still use the local dictionary feature. The spelling errors that have a red underline come from the dictionary, while errors with a green underline are detected by the web service. Unfortunately, Google's technology is not smart enough to find mistakes like "its a wonderful life" or "their coming today". Looks like the right-click menu isn't there on OSX; there's a setting in Prefs -> Show advanced, but enabling it doesn't do anything. Ctrl-click? Isn't that the mac way to right click? Here's a great way to showcase the advantages of the new spell-checker. Type in the sentence, "Is tehre a solution to tehre problem for when tehre traveling?" All 3 mistakes are misspelled exactly the same, yet Chrome will offer "there" for the first, "their" for the second, and "they're" for the third.